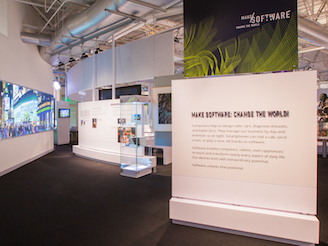 We all know how computers have made huge changes to our lives but did you know there’s a Computer History Museum here in Silicon Valley dedicated to their history and ongoing impact? It’s in Mountain View, at 1401 N. Shoreline Blvd. There you can take your children and their friends, whether they’re interested in math, chemistry, physics, biology or computer science, even planning to have a STEM career or just average tech-oriented kids of today. They’ll be able to see various multimedia exhibitions, listen to computer pioneers tell their story from their own perspective and check out, and maybe chuckle at the difference between those very first computers from the 1940s and 1950s and the ones they use today. In terms of ongoing impact, one of the cutting edges of computer science and information technology today is artificial intelligence (AI). On Friday, April 20 at 5:30, part of their Friday Night Speaker Series, the museum will be teaming up with Silicon Valley Artificial Intelligence (SVAI) for their second annual AI Download. Engineers, researchers, scientists, startup founders and others will be discussing AI activity happening across the Bay Area, highlighting academic research, learning resources, community initiatives and work that’s happening at local, leading AI companies. Again, whether they’re interested in math, chemistry, physics, biology or computer science, even planning to have a STEM career or needing help in English, Spanish or test prep, and you live in the San Jose area, Study Wizards has experienced and caring private tutors who can help. If they live elsewhere in the Bay Area, KnowledgeRoundTable.com is also a good place to find help.